Planetary science denies God and the universe Intelligent Design. It admits the existence of life’s intelligence but can not explain where the planetary life and its intelligence originates from. - The role of hemispheric clock-calendars in the universe life generation (gene energetics, “genergetics”) and evolution. 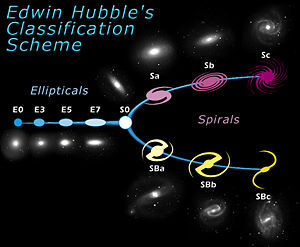 Elliptical galaxies have smooth, featureless light distributions and appear as ellipses in images. They are denoted by the letter E, followed by an integer n representing their degree of ellipticity on the sky. Spiral galaxies consist of a flattened disk, with stars forming a (usually two-armed) spiral structure, and a central concentration of stars known as the bulge, which is similar in appearance to an elliptical galaxy. They are given the symbol S. Roughly half of all spirals are also observed to have a bar-like structure, extending from the central bulge. These barred spirals are given the symbol SB. To understand better the universe “INTELLIGENT DESIGN” concepts the reader is encouraged to review the Urantia Book (and previously posted Papers 24-30 on www.LighttoParadise.com). Regarding the Andronover nebula, the Urantia Book describes the four general stages of nebular evolution. The primary stage of a nebula is circular (lenticular ->elliptical); the secondary, spiral; the tertiary stage (barred spiral) is that of the nebular first sun dispersion, while the quartan (barred spiral) embraces the second and last cycle of nebular sun dispersion, with the mother nucleus ending either as a globular cluster or as a solitary sun functioning as the center of a terminal solar system. “The Primary Master Force Organizers of Paradise have long been in full control of the space-energies before they were organized as the Andronover nebula. 987,000,000,000 years ago associate force organizer and then acting inspector of the Orvonton series, traveling out from Uversa, reported to the Ancients of Days that space conditions were favorable for the initiation of materialization phenomena in a certain sector of then easterly segment of Orvonton. 900,000,000,000 years ago the Uversa a permit issued by the Uversa Council of Equilibrium to the superuniverse government authorizing the dispatch of a force organizer and staff to that region. The Orvonton authorities commissioned the original discoverer of this potential universe to execute the mandate of the Ancients of Days calling for the organization of a new material creation. 875,000,000,000 years ago the enormous Andronover nebula was duly initiated. Only the presence of the force organizer and the liaison staff was required to inaugurate the energy whirl which eventually grew into this vast cyclone of space. Subsequent to the initiation of such nebular revolutions, the living force organizers simply withdraw at right angles to the plane of the revolutionary disk, and from that time forward, the inherent qualities of energy insure the progressive and orderly evolution of such a new physical galactic central sun system. 200,000,000,000 years ago witnessed the progression of contraction and condensation with enormous heat generation in the Andronover central cluster, or nuclear mass. Relative space appeared even in the regions near the central mother-sun wheel. The outer regions were becoming more stabilized and better organized; some planets revolving around the newborn central suns had cooled sufficiently to be suitable for life implantation. The oldest inhabited planets of Nebadon date from these times. Now the completed universe mechanism of Nebadon first begins to function, and Michael's creation is registered on Uversa as a universe of inhabitation and progressive mortal ascension. 75,000,000,000 years ago this nebula had attained the height of its sun-family stage. This was the apex of the first period of sun losses. The majority of these central suns have since possessed themselves of extensive systems of planets, satellites, dark islands, comets, meteors, and cosmic dust clouds. 8,000,000,000 years ago the terrific terminal eruption began. Only the outer systems are safe at the time of such a cosmic upheaval. And this was the beginning of the end of the Andronover nebula. This final sun disgorgement extended over a period of almost two billion years. 7,000,000,000 years ago witnessed the height of the Andronover terminal breakup. This was the period of the birth of the larger terminal central suns and the apex of the local physical disturbances. 6,000,000,000 years ago marks the end of the terminal breakup and the birth of Monmatia sun, the fifty-sixth from the last of the Andronover second solar family. This final eruption of the nebular nucleus gave birth to 136,702 suns, most of them solitary orbs. The total number of suns and sun systems having origin in the Andronover nebula was 1,013,628. The number of the Monmatia solar system is 1,013,572. Presently, the great Andronover nebula is no more, but it lives on in many of its galactic suns and their planetary families which have originated in this mother cloud of space. The final nuclear remnant of this magnificent nebula still burns with a reddish glow and continues to give forth moderate light and heat to its remnant planetary family of one hundred and sixty-five worlds, which now revolve about this venerable mother-center of two mighty generations of the Andronover’s galactic central sun system monarchs of light. 5 billion years ago the Urantia’s solar system was a comparatively isolated blazing orb, having gathered to itself most of the near-by circulating matter of space, remnants of the recent upheaval which attended its own birth. Today, Urantia’s sun has achieved relative stability, but its eleven and one-half year sunspot cycles betray that it was a variable star in its youth. In the early days this sun has continued to contract and consequent gradual increase of temperature initiated tremendous convulsions on its surface. These titanic heaves required three and one-half days to complete a cycle of varying brightness. This variable state, this periodic pulsation, rendered Urantia’s sun highly responsive to certain outside influences which were to be shortly encountered. If the Andronover nebula with its protoplastic disc was intelligently initiated, how was it done? To envision this process by minds eye it will be helpful to imagine Bob and Alice (Picture 3 A-E, Paper 54 www.LighttoParadise.com, Einstein-Podolsky-Rosen/EPR/ theorem) as Yin (Female) and Yang (Male) dancers initiating their many times rehearsed CCW (counter-clockwise) vortex spin on the dance floor finally withdrawing at right angle to the plane of their revolutionary spin-circle. As stated above (UB 57:4.1) the primary stage of the initiated nebula is circular (lenticular -> elliptical); the secondary, spiral; the tertiary (“barred” spiral nebula) stage is that of the nebular first sun dispersion (UB 57:3,12; 100,000,000,000 years ago the nebular apex of condensation tension was reached; the point of maximum heat tension was attained. This critical stage of gravity-heat contention sometimes lasts for ages, but sooner or later, heat wins the struggle with gravity, and the spectacular period of sun dispersion begins), while the quartan (also “barred” spiral nebula) embraces the second and last cycle of nebular sun dispersion, with the mother nucleus ending either as a globular cluster or as a solitary sun functioning as the center of a terminal solar system. Force Organizers initiate their spin by following the universe inherent Paradise CCW North-South line where there is the greater out-pressure of the force-energy at the north end of its charge and polarity female type vortex (UB 11:2.3). It is exactly that along the north-south arms of the barred spiral nebula where the space matter is released.